Posted August 15th, 2018 by Ms. Jen & filed under art + photography, nature + environment. Tues. 08.14.18 – The great thing about the early evening sky this summer is that four of the five visible planets have been strung out like little jewels across the southeastern to western night sky: Mars, Saturn, Jupiter, and Venus. 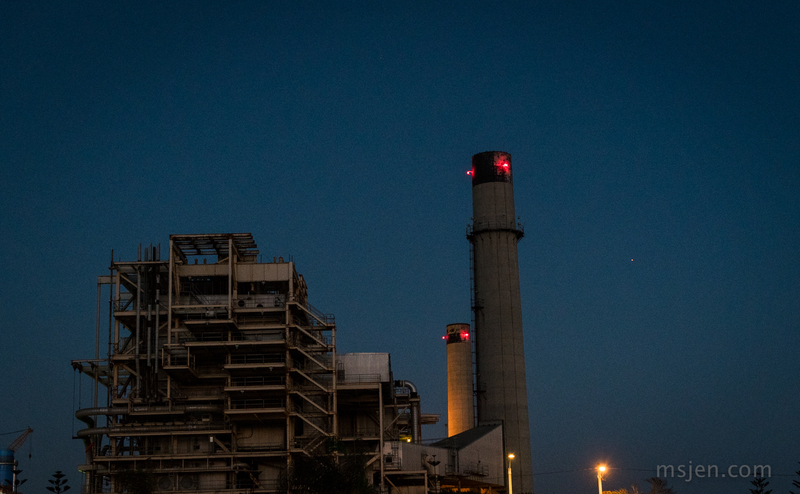 Here is a photo of Mars rising next to the Newland power plant. Photo taken by Ms. Jen with her Nikon D850 and a Nikon 50mm f/1.4G lens. Posted March 3rd, 2018 by Ms. Jen & filed under nature + environment. Thursday, March 1st was the full moon. Late Thursday night / very early Friday morning, the local coyote society decided to yip and howl out an ode to the Full Moon. It started with one coyote making a low keen, a second joined in with a howl, and before you know it a number of coyotes were yipping, keening, and howling – of which started off several local dogs to barking. The dog barks were in a low, fierce tone. The coyote yips, keens, and howls were at least an octave higher on the musical scale and more delicate. It was as if the coyotes were singing a love song to the full moon. Posted August 21st, 2017 by Ms. Jen & filed under art + photography, nature + environment. 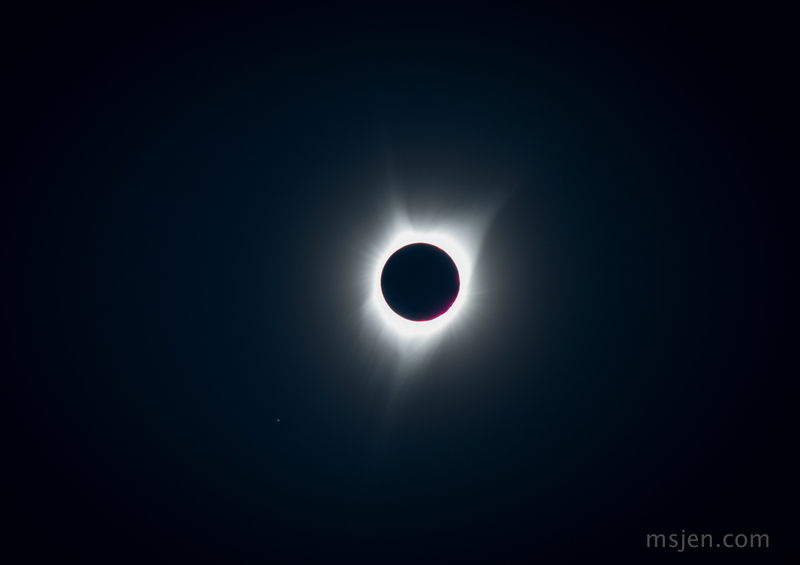 08.21.17 – Photo of the Eclipsed Sun and Regulus taken by Ms. Jen at the Ochoco Reservoir, Prineville, Oregon, with her Nikon D800 and a Nikon 70-200 f/4 lens set to 200mm. Posted May 18th, 2016 by Ms. Jen & filed under art + photography, nature + environment. 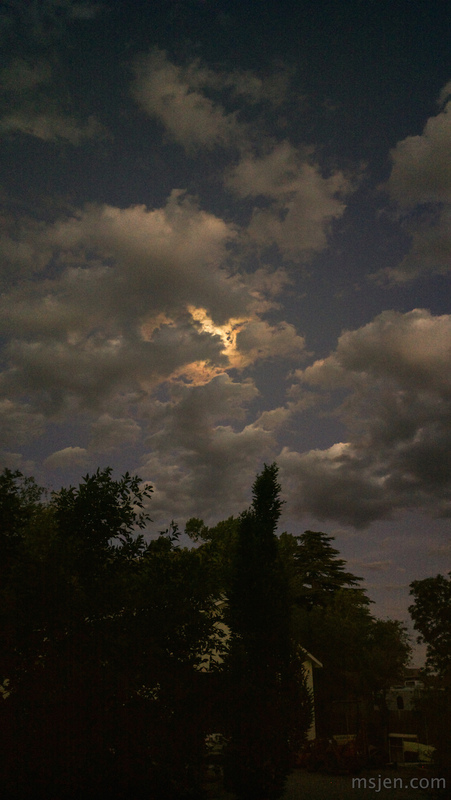 Photo taken by Ms. Jen with her Nokia 808 PureView. Posted February 22nd, 2016 by Ms. Jen & filed under art + photography, moleskine to mobile. 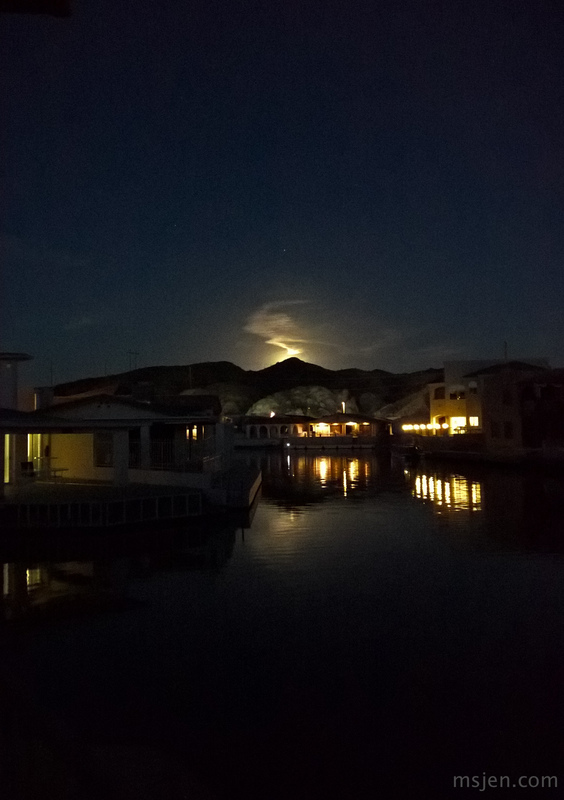 Mon 02.22.16 – The full moon rising over the Moovalya Keys, it was truly lovely. 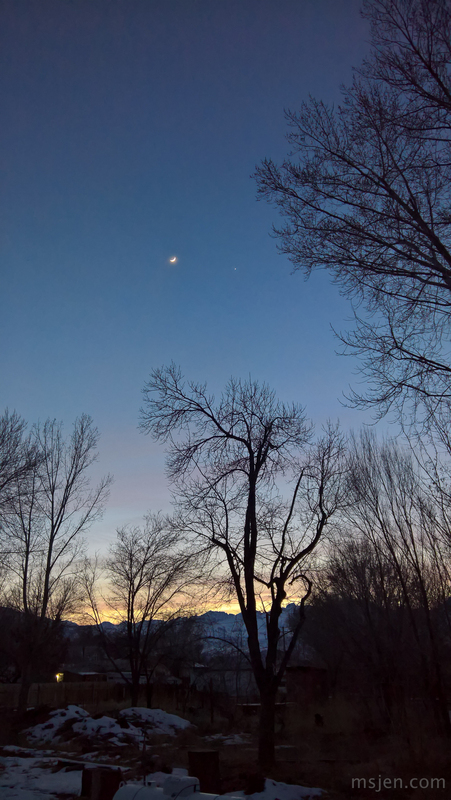 Photo taken by Ms. Jen with a Lumia 950 camera phone. Posted January 12th, 2016 by Ms. Jen & filed under art + photography, nature + environment. 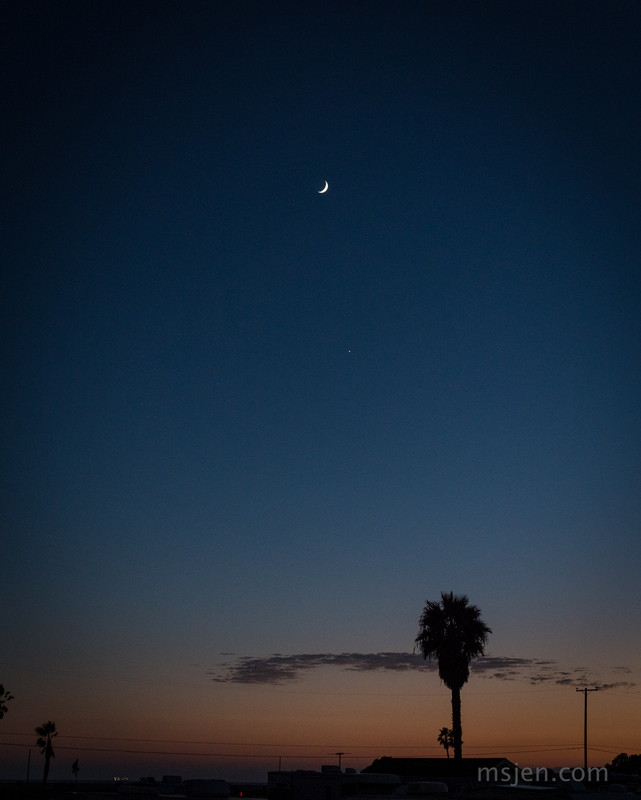 Mon 01.11.16 – While driving just after sunset eastbound on California highway 62, I knew that the new crescent moon would be setting soon behind me. 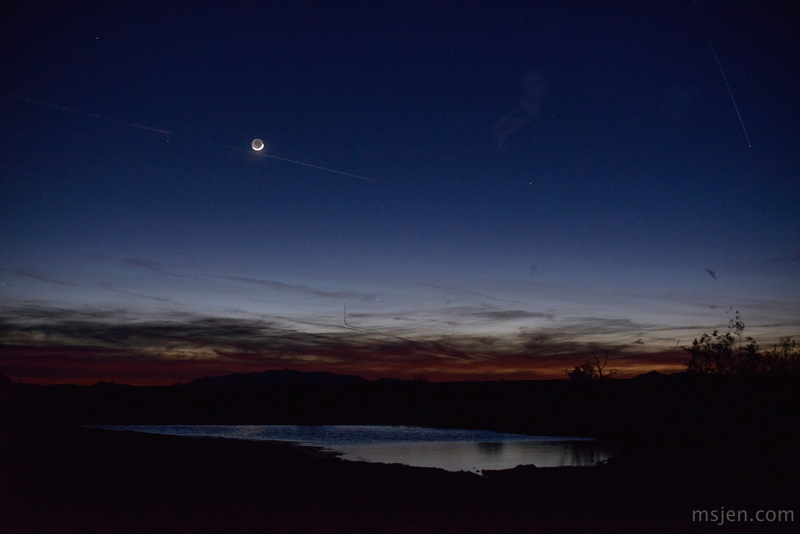 As the dusk deepened, the road turned to Vidal Junction and out of the farside of my left side vision, I could see the moon. I pulled over as soon as it was safe to do so and saw this large puddle from recent rains in the desert and was delighted. I pulled out the Nikon D800 but could not unearth the tripod from under the luggage, so here is my photo of the Moon and the Puddle.